Must confess, doesn't look like drone brood from this angle(except on bottom). 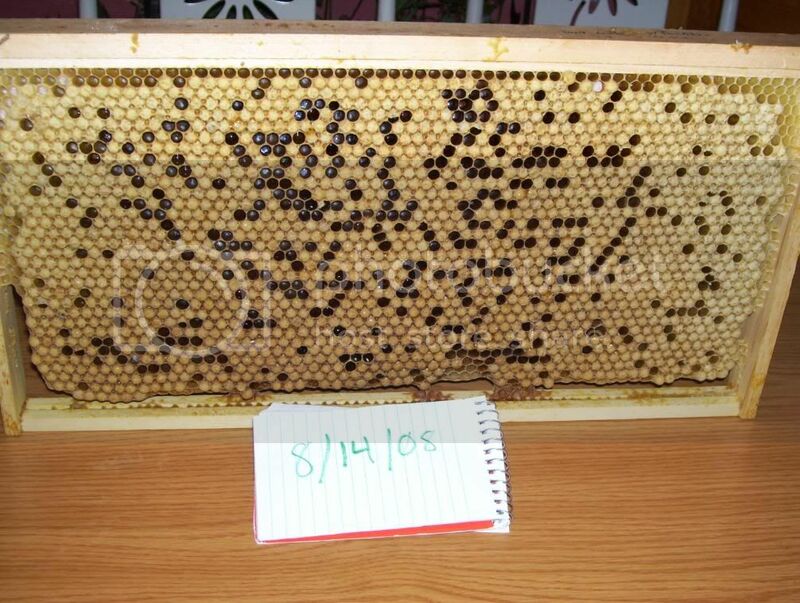 Great brood pattern for this time of year, my queens are shutting down for fall already and we have similar weather. "The more complex the Mind, the Greater the need for the simplicity of Play". Oh, that is much earlier. I wish that this was a current photo. I've just recently gotten a beemaster account and have wanted to post that one for a while now. My drone combs are much spottier now too, with the exception of a few colonies. Are you also still doing drone comb treatments? But since drones are essentially mooches anyway... I would think anyway, that removing them at any stage, preserves some of the resources they would have taken. Though they may play an important phermone role. According to MB, all it takes is one drone frame removed to keep the mites at bay. 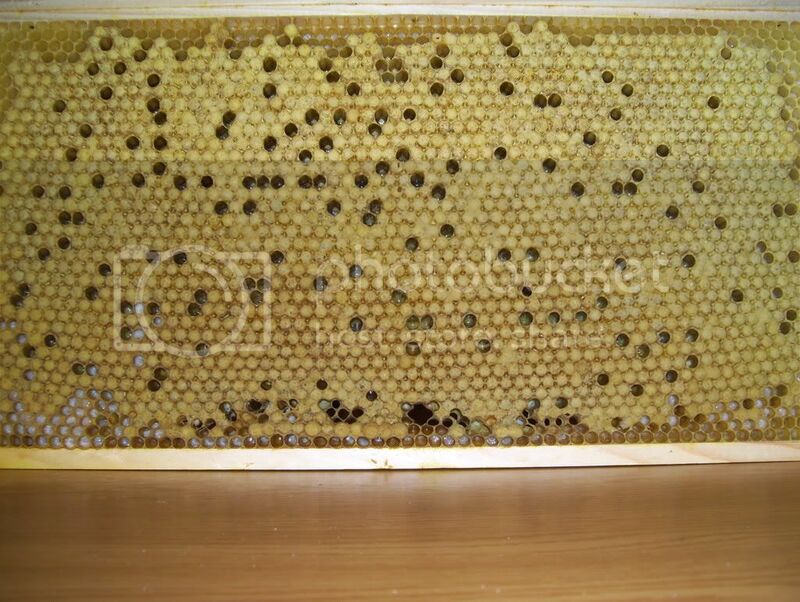 Also he says the hive will keep on making drone brood until they get as much as they want. This has been my experience this summer. I have removed a frame of drone brood every month for 3 months. Right now the mite count is very low. We shall see at some point if this works all the time. It seems to help a lot for me. No more crinkled wing disease, and I've had to do no other treatments. Talk to me in a couple of years, and that'll tell the story a little better though. This is about what I'm seeing now on my average drone combs. I had some better than this but they're already in the freezer. Is this foudationless or wireless foundation? Or are the wires hard to see in the photo? Forgive me, but I've got little experience and am not familiar "Headin to the freezer." and what I was looking at in the picture. Thanks. SC - Yeah, these two are wireless foundation. I have quite a few that are foundationless. I've had best luck getting my bees to build consistent foundationless drone comb in empty frames in the letter portion of the year. I used foundation when I needed to build drone comb early in the year, otherwise I end up with part worker comb, part drone comb, and that's just no good at all. Yeah, many frames end up with a chewed out are at the bottom. Most times this seems to get filled at least partially in the late fall with drone comb, or if not, sometimes the following year...but not always. Some colonies just seem to like to have that communication space. It realy seems to me that in my boxes that I have all the beespace dimensions just right, I end up seening these empty spaces. In the ones that have too large a gap between boxes, I get burr comb between the boxes, but the bottoms of the combs don't get chewed away. Too small of a space below the top bars and bottom bars, and they'll defintely chew them away for communication/travel space. At least that's what I seem to see. MSW - Heading to the freezer means that I've removed this drone comb in hopes of taking a healthy portion of my mite load with it for that colony, and am sticking it in the freezer. Sounds barbaric killing the drones but this is a good way to get rid of a lot of the mites, without chemical use, and while supers are on. I started doing this last year in a few colonies, and now do it in all my double-deeps and bigger colonies, and I see very few mites, and no crinkled wings anymore. The frames that you're seeing are all drone cells, mostly capped (mites trapped), with the more consistent frame being (I beleive) from May 30th, and the second spottier one from August 14th. Hope this helps with the questions, please ask if you have more, or see (spoiler - shameless Michael Bush plug:) ) Michael Bush's website for info on drone comb useage. I'd be thrilled to have foundationless comb like that, even if they were drone. My understanding (in foudationless usually the first ones they draw) is they are gonna draw a certin amount of drone comb. Let them do it and move them to the outside if the brood cluster.